Isabella Echeverri and Melissa Ortiz say they hope to raise awareness in Colombia and improve the national team for future generations. The federation did not immediately respond to requests for comment on the accusations. Colombia’s national team did not make the field for the Women’s World Cup this year. In a telephone interview with The Associated Press, Ortiz said she and Echeverri realize that the consequences of speaking out mean they likely won’t rejoin the national team in the future. Ortiz, 28, played her last match for the national team in 2016 and she was an alternate for the team at the Rio de Janeiro Olympics. She essentially walked away from the team last year. Ortiz and Echeverri want to reduce the long periods between each season and be paid enough to live off their wages. Ortiz said that the team went without matches or training camp for over 700 days following the 2012 London Olympics, and more than 400 days following the Rio Games. After the team fared poorly in a tournament last summer, the two players explored taking action. And now, a few months away from the Pan American Games, the team has no coach, Ortiz said. “We have been inspired by a whole bunch of different things that had a snowball effect and made us want to speak out,” Ortiz told the AP. She said the two chose social media because of its reach. 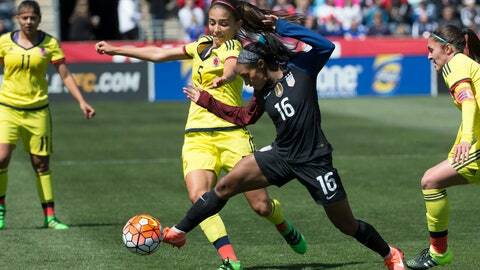 Some advances in women’s soccer have been attempted by Colombia in recent years. The nation has even expressed interest in hosting the 2023 Women’s World Cup. In 2017, the federation and professional league Dimayor started a women’s pro league in Colombia that is set to play its third season this year. Millonarios and Sergio Arboleda University are starting a women’s team next season. The players who join the new club will have stipends, but wages will still be low. But there have also been setbacks. Last month the owner of Deportes Tolima, Gabriel Camargo, said women’s soccer in Colombia is a “breeding ground for lesbianism” and accused female players of not behaving professionally and drinking too much alcohol.